Massive dueling rallies filled the streets of the Venezuelan capital of Caracas on Saturday reflecting a deep divide over embattled President Nicolas Maduro's rule as the country plunges further into unrest. But it appears Maduro has shown signs of bowing to the pressure as in a speech before supporters he floated the idea of holding early elections for the opposition-controlled National Assembly. Maduro said in a speech before thousands of supporters that he "agreed" and was "committed to holding parliamentary elections this year," as demanded by the National Assembly. "They (the opposition) want to bring forward elections, let's have elections," he said defiantly just ahead of the Sunday deadline set by European nations to hold fresh presidential elections, though he stopped short of any reference to fresh presidential elections. Mr Maduro addressed a rally in Caracas on Saturday and proposed bringing forward parliamentary elections, scheduled for 2020, to this year, as he sought to damp down demands for presidential elections. He said the constituent assembly, which he controls, would debate ordering elections in the rival national assembly, which is opposition controlled and headed by Mr Guaido. 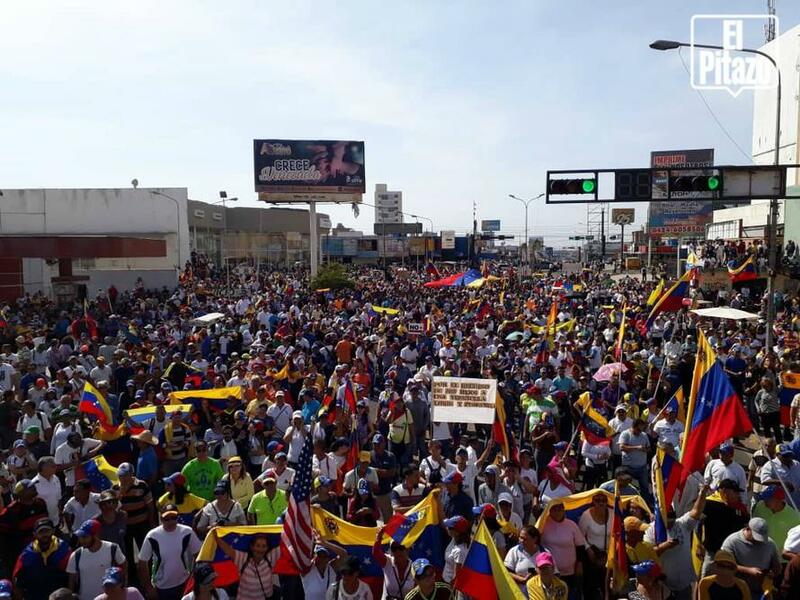 Meanwhile Guaido's massive level of support was not in dispute on Saturday. He personally addressed huge throngs in Caracas neighborhoods. 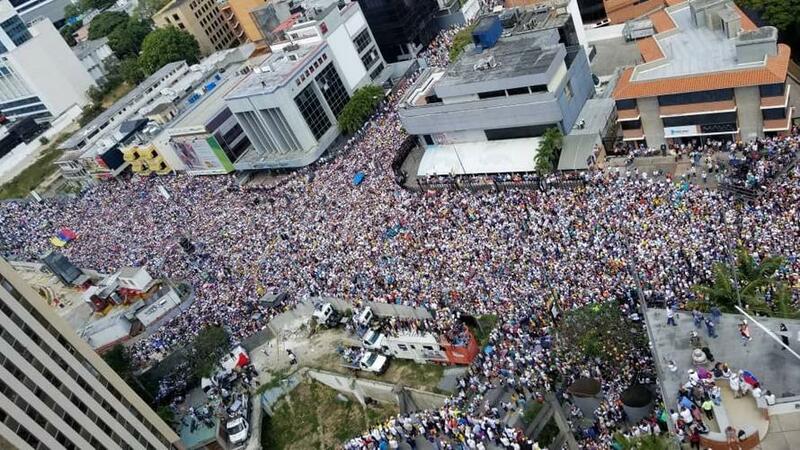 Supporters of Juan Guaido gathered in Caracas on Saturday. The morning began with headlines announcing the defection of a top air force general who declared US-backed opposition leader Juan Guaido the sole legitimate head-of-state in a social media video which further urged the military to overthrow Maduro. 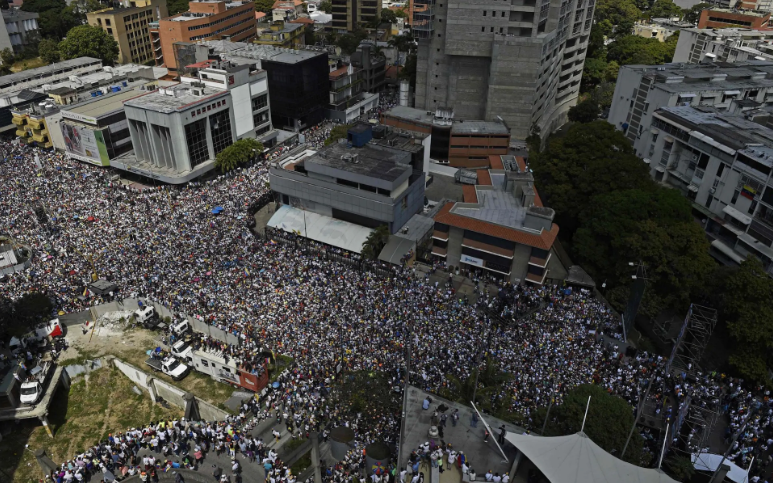 While there's yet to be signs of any wave of military defections coming after Gen. Francisco Yanez, identified as part of the air force's high command, urged the armed forces to change loyalties, anti-Maduro crowds filling streets throughout the country but mostly in Caracas have been estimated at between 400,000 and 600,000 people, with some journalists speculating that over a million nation-wide are in the streets in support of Juan Guaido. US National Security Advisor John Bolton seized on the moment to say via Twitter just hours after: "The US calls on all military members to follow General Yanez's lead, and to protect the peaceful protestors supporting democracy." This came after Bolton announced late Friday that the US will begin humanitarian aid shipments into Venezuela, despite Maduro denying acceptance of such aid. Guaido on Saturday said he would receive the aid to be shipped through Brazil and Colombia as "interim president" — though it remains unclear how this will happen other than via covert means so long as Maduro remains in charge of his loyal security forces and military. Live shots of pro-Madruo demonstrations were carried throughout the day by Russian media, however a number of western journalists disputed the apparent large size of the protests. Bolton further appealed on Saturday directly "to the Venezuelan military high command" urging it to immediately "stand on the side of the Venezuelan people" in order to "defend the constitution and democracy for Venezuela!" — according to a tweet. Social media was flooded with images of large anti-Maduro protests on Saturday. Video in some cities appeared to show the police siding with the anti-Maduro demonstrations after reportedly refusing to disband the protests. While what seem's like Bolton's now full-time position as White House cheerleader for a coup has fueled new optimism and momentum inside Venezuela, there were also significant but reportedly much smaller pro-Maduro protests varying in size held across cities on Saturday, a trend the media has paid scant attention to the past weeks. Tens of thousands of protesters poured into the streets of Caracas on Saturday in rival displays for and against embattled Venezuelan President Nicolas Maduro, as an air force general became the highest-ranking officer to recognise opposition leader Juan Guaido as the crisis-torn country's acting president. The rival rallies, convened in different parts of the city, come on the eve of a deadline set by the EU and other European powers for Maduro to call “free elections” or have them recognise Guaido. As journalists and analysts, most of them thousands of miles away from the streets of Venezuela, continue to debate online which side has more support, the real determining factor will be the loyalty of the military, which at this point doesn't appear to be folding.